If you or someone you know would be interested in having Rabbi Neal come and speak, send your request to: kehilatsarshalom@gmail.com. 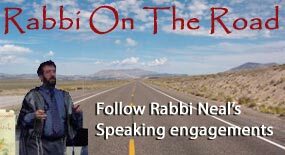 Rabbi Neal can speak about any of the Biblical festivals (Leviticus 23), the history, present and future of Israel, and many other selected topics. Or, he is more than happy to accommodate special requests. In addition, Rabbi Neal and his wife, Kim, have a vibrant music ministry. So any message that you would like to have brought to your organization can also be brought with special music. They would love the opportunity to come and worship with you. We are looking forward to worshipping with you this Sunday at CrossCurrent.